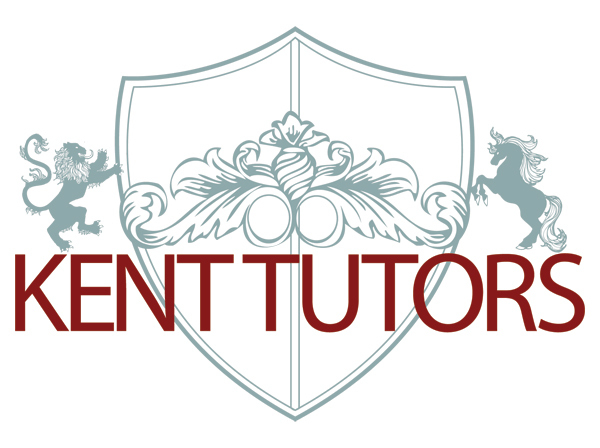 This is the final logo design for Kent Tutors -It was a great one to work on mixing traditional style with contemporary elements -I loved drawing the lion with his fiery tail in particular! Just as a slight variation I have also included one of the original alternative ideas I was working on with crowns to suggest the classical influence (in the end I thought it was too regal looking, but I liked the overall image) …but Carpe Diem and get those noses to the grindstone! 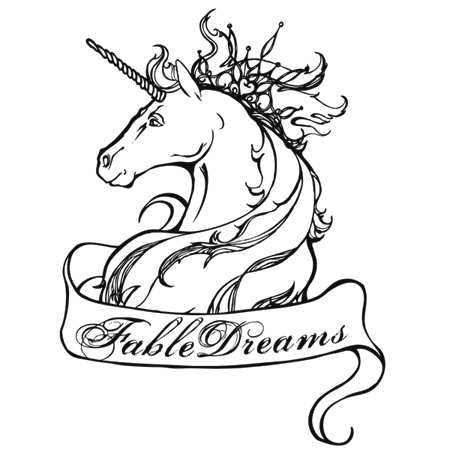 This illustrated identity was created for FableDreams, a vintage inspired tiara and hair accessory company. 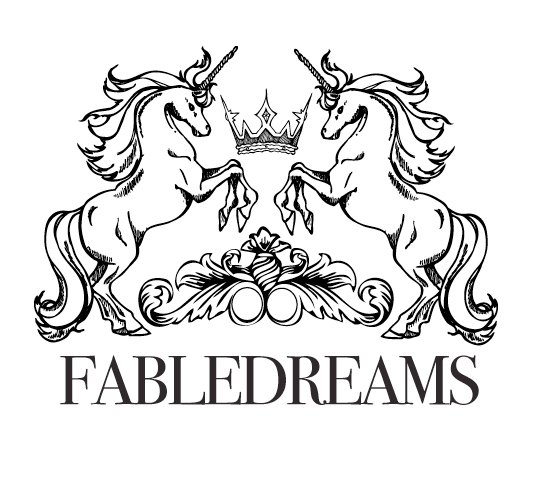 It was important to create a logo that captured the magical and fairytale elements that inspired the brand, as well as being beautiful and hair focused. So if you are in the market for a magically special headdress then look no further! To give a bit of background and show how the final logo evolved I have included one of the working rough drawings I designed mid way through the brief. The unicorns are shown in full and there is more of a focus on traditional heraldry design and the accessory is a crown and the type set in a bolder style. This then got altered to the focus on one unicorn and mainly the head and hair, and changing the crown to a tiara and the type to a softer, more flowing style to be more feminine. I was asked to create an illustrated logo for the underwear company Florrie & Minnie, the brief was to create something classic yet contemporary (-see the above shield logo.) The girls in pink are some sketches to get in the right frame of mind and to add a little bit of pin up for a mid week morning! Black ‘n White baby! 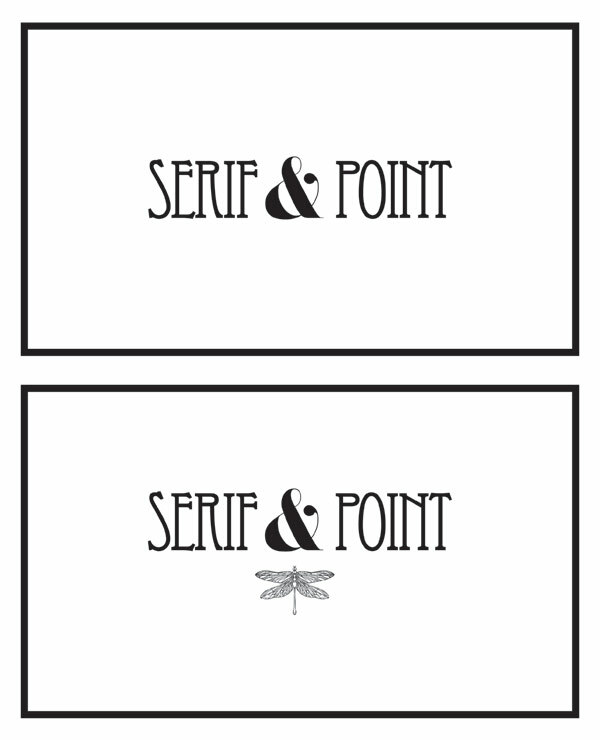 I was commissioned to design some custom illustrated wedding invitations for a transatlantic couple! (based in London and Cambridge, Massachusetts) I thought it would be a great to design in storybook style illustration whilst mixing the two skylines and adding in a few magical elements that were important to the couple in question. The end result is a truly unique and personalized wedding invitation that the couple really love and also want enlarged and screen printed version to keep for their wall! Logo Design and Digital Explosion Illustration! Something I was working on before heading out to Australia for the past month! 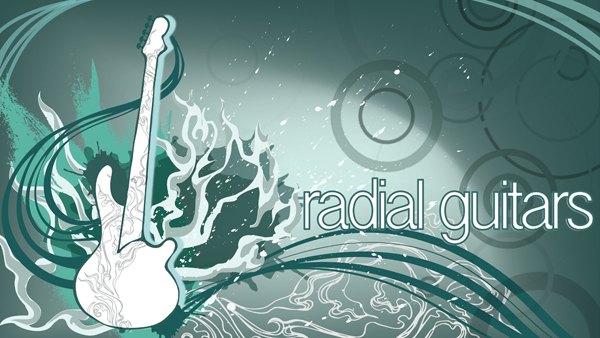 The brief was to create a logo design for Audio Array and a digital illustration for the website of Radial Guitars. I had great fun playing with the logo and adding a bit of 80’s nostalgia with the cassette references in the logo and drawing flames of ice for the Radial Guitar illustration! Ice flames rule the school! My beautiful new business cards landed today! -Magpies all over the country will be jealous, matt black card with silver foil lady luck embossed on the front, and white lettering and a couple of illos on the reverse! -I’m quickly scheduling meetings and appointments left right and centre to drop these babies on the streets -so get in touch to get your mitts on one for your very own! Not my usual style of illustration but I was asked by the excellent fellow that services my car for an illustration to use on his website, so a great excuse to draw my beautiful car in the sunshine and champion the method of payment-in-trade! This was my logo concept for MTV’s new talk show “It’s On With Alexa Chung” I was invited to pitch for the logo and backdrop design for the set, they went with a different design in the end (aww shucks!) but I really enjoyed creating the custom typography and putting this one together, so I thought rather than letting it hid away shyly on my hard drive, I’d give it a chance to see the world and post it here!